California water restrictions: Jerry Brown takes action, but gives the agriculture industry a pass. California Imposes First-Ever Mandatory Water Restrictions. They’re Not Nearly Enough. 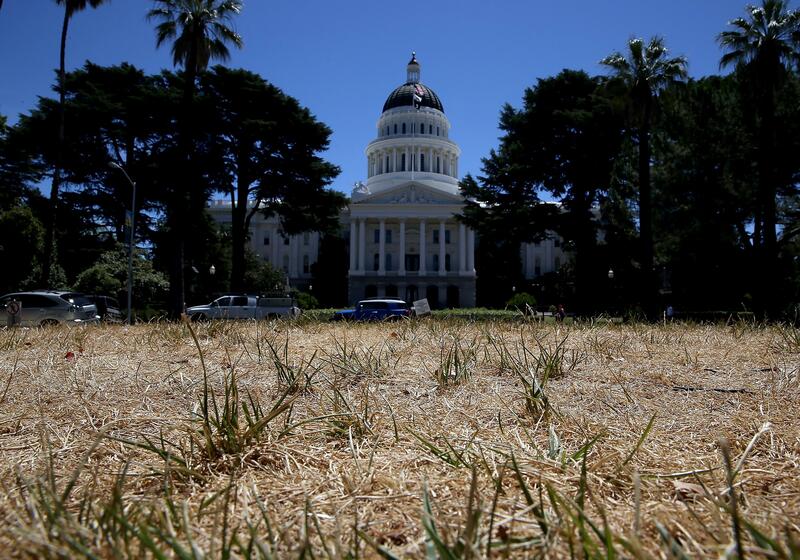 The lawn in front of the California State Capitol is seen dead on June 18, 2014, in Sacramento, California, amid an effort to conserve water. On Wednesday, California Gov. Jerry Brown announced a historic statewide effort to restrict water use amid new measurements showing the state’s snowpack at stunning record lows. Unfortunately, the new rules mostly ignore the state’s biggest water user: the agriculture industry. “We are standing on dry grass where there should be five feet of snow,” said Brown, who traveled to an official snowpack monitoring station near Lake Tahoe to make the announcement. Brown’s new executive order cracks down primarily on urban water usage, mandating a 25 percent reduction by February 2016 from the amount used in 2013. The new rules focus on lawns and golf courses, which use about half of urban water in California, and set a target to replace 50 million square feet of lawns with native landscaping within the next year. By cracking down on lawns and expanding existing technology like water recycling, urban areas should easily be able to meet the new restrictions. In an average year, urban areas and industry use only about 20 percent of the state’s water resources, with agriculture using the rest. The state’s snowpack, which typically peaks on April 1 before the summer runoff season, was measured at a record low on Wednesday—just 5 percent of the historical average. The last record low—25 percent of the historic average—was set just last year, in a tie with 1977. In addition to a record-low snowpack in the Sierras, 2015 is shaping up to be among the hottest and driest years in state history. Temperatures have been in the 90s in Southern California for most of March, more typical of late August. In an email to Slate, the state’s snow survey chief, Dave Rizzardo, called the snowpack reading “scary,” saying “we’ve obliterated the record.” In a typical year, the state’s snowpack supplies about 30 percent of statewide water usage. This year there will be barely a trickle in mountain streams, leading to profound impacts statewide. In a conference call with reporters, Rizzardo said that one or more reservoirs in the central and southern Sierra range—the part of the state hardest-hit this winter—may go completely dry this year. Though California’s agriculture industry is also feeling the drought’s pinch—hundreds of thousands of acres of farmland have gone unsown, and thousands of jobs have been lost in the last year—the industry is still mostly getting its way. This year almond farming is using more water than ever—about 11 percent of the statewide supply devoted to agriculture—while lobbying to weaken groundwater legislation. As I’ve written previously, wasteful agriculture is literally sucking California dry. Once devoid of water, depleted aquifers frequently collapse, resulting in sinking ground levels and a permanent reduction in water storage capacity. New laws aimed to stop the overexploitation of groundwater won’t be enforced until 2040. The governor should have sped up that timeline as part of his suite of mandatory cutbacks. And lest you think he can’t, because of his state’s bottom line: In exchange for 80 percent of the state’s water, agriculture is producing only 2 percent of state GDP.